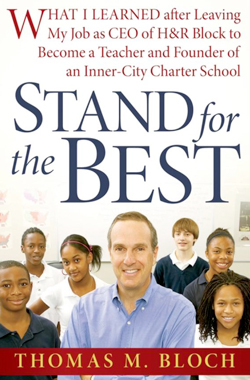 If you ever need inspiration to follow your dreams, take a look at Thomas M. Bloch’s story in Stand for the Best: What I Learned after Leaving My Job as CEO of H&R Block to Become a Teacher and Founder of an Inner City School. This motivating memoir to teaching follows Bloch from his decision to leave an almost million dollar salary to teaching middle school math in a windowless room to co-founding a successful charter school, University Academy, for an impoverished, inner-city community of Kansas City. It was definitely hard for Bloch to leave his post at head of his father’s company; the company started with just “an idea and a $5,000 loan,” but he had to do what felt was right for him. He wanted to academically help under performing children, through whom he would help himself. An excellent example of following your heart, or answering “a higher calling,” as Bloch puts it, this story shows just how much doing the right thing doesn’t always have to do with making the most money. When he first started teaching part-time, his yearly salary was the same as his salary for just one week when he was a CEO! Although he gave up money, he gained so much more from life. He got to spend more time with his family, including two young boys, and he got to help the lives of others in a way that really felt satisfying. This is a real story. Tales of triumphs and failures are recounted. Bloch wasn’t able to reach every student, but the ones he did went on to become successful people, imparting knowledge and hope to others. For example, one student went on to graduate college and become a math teacher, just like Bloch. This may seem like an ordinary thing in today’s world, but this student came from a environment where most seventh graders were not able to do fifth grade work. From Bloch’s example, you’ll see all the various virtues that bring life’s real gifts; that a little apple that reads “Greatest Teacher” can be the best year-end bonus ever.